2015 Films: a strong year for Women in Film! I’m not a huge fan of lists. How does anyone classify the BEST films of the year anyway?! It’s all about access and timing and personal preference. I felt this was a great year for women, both in front of and behind the camera. True, there are no women-directed films in the running for the coveted Oscar for Best Film. But there was a lot of strong work out there. And there was a welcome focus on the need for women and minorities to be SEEN and be given a place at the table. Mad Max: Fury Road: I was blown away by this film and found it to be the best in the franchise. With a woman in the lead to boot! This was one that you really needed to see on the big screen. Charlize Theron was brilliant but all the performances were fully-realized. Here was full-throttle action with a feminist bent and I loved it. Best Sequel: Pitch Perfect 2, with a great cast and almost as many funny moments, this film was directed by Elizabeth Banks. A little light on the “feels”, it could’ve used a little more emotional resonance and a little less of Hailee Steinfeld, playing the up-and-coming new member. Carol, The Danish Girl, Mustang, Sworn Virgin, Diary of a Teenage Girl, Me, Earl and the Dying Girl, and Ex Machina: What do they all have in common? A central character that’s a complicated woman; someone coming into their own and overcoming tremendous odds. Death, loss of a child, loss of a childhood innocence, loss of husband as he becomes a she…even escaping sexual slavery to claim an identity. All of these films feature an incredible performance by a leading lady or young lady that is worthy of a second viewing and gives me hope for women in film. Heart of a Dog: Laurie Anderson’s meditation on love and death was a tone poem that worked cinematically. It left me feeling mournful but also uplifted. I enjoyed the costumes and cinematography in Cinderella. I felt the best super hero movie was the unassuming, and full of heart, Ant Man. Brooklyn was a charming film that I hope everyone will get to see. Saoirse Ronan continues to give such heart-felt performances and is radiant in this film. I was saddened that so many of the Holiday-release films were so violent or depressing and I’m sorry that more people did not go to see Joy. The trailer was a mess and I don’t think they did a good job marketing the film. But hopefully, Jennifer Lawrence’s win at the Golden Globes will bring more people to this empowering film. 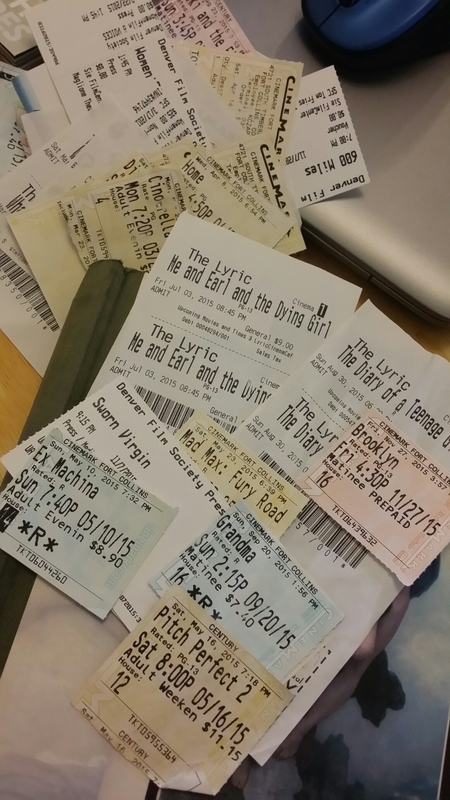 There were so many wonderful films in 2015 and as we all catch up on the ones we missed, I hope you’ll find some that challenge, delight and surprise you!